I think there might be something wrong with me. Well, there’s LOTS of things wrong with me, but I mean I think I might be slightly allergic to certain preservatives or something like that. When I say I don’t like canned condensed cream soups, I really mean it. It’s like there’s something artificial in there that my body doesn't like so it tries to put me on lock-down by telling my taste buds to run. The same is true for packaged marinated meat. You know, like the marinated turkey breasts or pork tenderloins you can get in the meat section at the grocery store? People seem to just love them but there’s something in there that doesn't jive with me. They almost have a metallic taste to me. Anyway, I do like the concept of those marinated meat selections so this is what I do instead… I buy whatever’s on sale (chicken breasts, pork tenderloins, etc. ), plop them in a freezer bag with marinade and freeze them. The day before I want to cook one, I just pull it out of the freezer and let it defrost in the refrigerator overnight. While it’s defrosting, it’s marinating too. 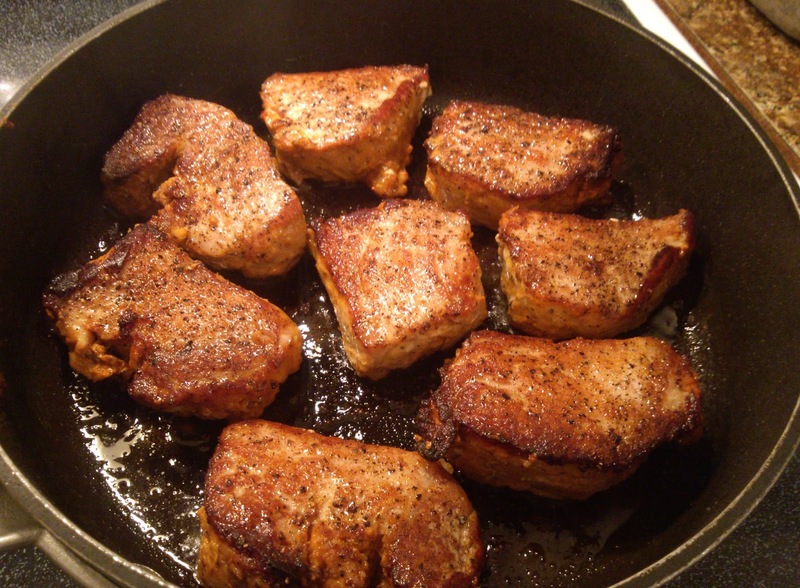 And speaking of pork tenderloins, I like to cut them into fillets or medallions when I’m pressed for time. They cook super quickly this way so it’s perfect for weeknight meals! Place pork tenderloin in a large zip-top plastic bag; set aside. In a small bowl, mix marinade ingredients and whisk together until thoroughly combined. Add marinade to the pork tenderloin and seal bag tightly. Marinate pork for 6-8 hours or overnight. Remove tenderloin from marinade and slice into 2-inch thick medallions (my 1.5 tenderloin yielded eight 2-inch medallions). Season each medallion lightly with salt & pepper. Discard marinade. Add 3 tablespoons vegetable oil to a large skillet over medium-high heat. Add medallions and sear for 3-4 minutes or until nicely browned. Flip medallions, reduce heat to medium and cover skillet. Cook, covered, for 5-6 minutes or until medallions are just done. Remove from heat and rest for 5 minutes before serving. I am new to your blog (LOVE IT THO!) and I had to comment. Yes! I have the same problem with the pre-marinated meats. And the cream of *whatever* soups. My husband thinks I'm crazy, but you have validated me!! YESSSS! Validation is the best! Do you think you could slice the tenderloin into medallions then marinate , or would it make the pork mushy? Just was thinking you'd get even more flavor that way. Thanks for the good recipes!!! Sure! There's not enough acid in the marinade to break down the protein so I don't think they'd be mushy at all! Could this be cooked in the crock pot? You may be allergic to gluten. Made this tonight on the grill... marinated the tenderloin medallions for about 3 hours then grilled for a few minutes on each side. Delicious! Awesome! I bet the grill made it extra yummy! Thanks for your comment! Thank you for this recipe! It is quick and tastes amazing.